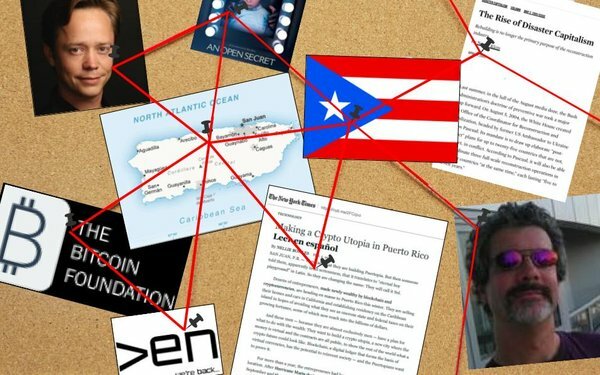 It’s been more than a week since The New York Times ran its long, strange trip of a story “Making a Crypto-Utopia in Puerto Rico.” I’ve been waiting for somebody — anybody, even that blowhard fraud Alex Jones — to take a magnifying glass to the hints hidden slyly between the lines. Nobody has. So here we go. Buckle up. It sounds dreamy on its face, but it’s actually the worst kind of example of what social activist and author Naomi Klein has coined "Disaster Capitalism," a predatory form of private enterprise that profits from the desperation and fear created by calamity to institute sudden and extreme social and economic engineering. Bowles does a good job giving these men enough rope to hang themselves: “While it was really bad for the people of Puerto Rico, in the long term, it’s a godsend if people look past that,” one dude says. But she walks on eggshells when it comes to profiling the leader of this crypto-capitalist crew: Brock Pierce. Pierce, 37, is presented as an odd duck, dressed all in black like a hipster Johnny Cash. Multiple times a day, he plays video of speeches from “The Great Dictator,” Charlie Chaplin’s 1941 parody of Adolph Hitler. Pierce, we’re told, is chairman of the Bitcoin Foundation (a trade group made up of hundreds of individuals and companies to promote cryptocurrency) and “a controversial figure,” although we’re never told why. “He has previously been sued for fraud, among other matters,” is the most we’re told. Well, Pierce is so controversial that when he was named to the board of the Bitcoin Foundation, at least a dozen members resigned, claiming Pierce bought himself a board membership and cited the hypocritical non-transparency of the board’s vote to add him. Brock Pierce is also a major figure in Amy Berg and Gabe Hoffman’s beyond disturbing documentary “An Open Secret,” which you can watch for free here. The film lays it out far more completely than I can here, but in short: Pierce was a child actor. (He played the title character in Disney’s "The First Kid," the “Mighty Ducks” franchise.) In 1998, at the age of 18, he somehow became cofounder of Digital Entertainment Network (DEN), an early online-streaming video entertainment site aimed at “Generation Y Web surfers,” as the parlance at the time phrased it. In the midst of the millennium-ending dot-com bubble, DEN managed to raise an eye-popping $60 million, with financing from Microsoft, Dell and Hollywood luminaries like David Geffen, Bryan Singerand Gary Goddard. Founded in 1998, DEN crashed and burned spectacularly by mid-2000. This only scratches the surface of Brock Pierce’s many interesting lives, including how he made his first couple hundred million bucks as CEO of an online gaming and virtual merchandise company called IGE, for which he took financing from a Goldman Sachs guy named Steve Bannon, who later pushed Pierce out and took his place as CEO. Start digging around, however, and you’ll find a 2008 story from Radarthat ties IGE’s initial financing back to Marc Collins-Rector, the founder of DEN. Thank goodness for the Internet Wayback Machine, since the original version of that Radar story has oddly been wiped from its site. So Brock Pierce has one helluva backstory that, in all fairness, probably deserves a separate piece that I’m sure Bowles and the Times are working on. Or, if they weren’t, maybe they are now.